Blackwater National Widlife Refuge's wilderness provided protection to freedom seekers during Harriet Tubman's time. Today the natural landscape is largely unchanged and provides sanctuary to birds, wildlife and plants. See the Harriet Tubman Underground Railroad Visitor Center and become immersed in Harriet Tubman’s world through informative and evocative exhibits. 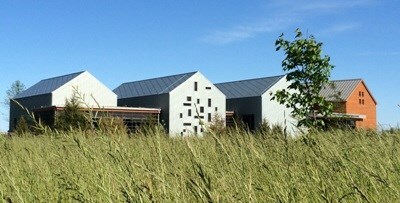 The center is the perfect place to become oriented to sites along the byway where Harriet's life unfolded. The new national historical park preserves the landscape where Tubman carried herself and others away from slavery. Hailed as the “Moses of Her People,” Harriet Tubman was a heroic leader in the fight against slavery. Her selfless efforts helped more than 70 enslaved people make their way north by way of the Underground Railroad. This Eastern Shore byway traverses a region abundant with African-American heritage, following a mostly northern path across a landscape that has changed little in the 150 years since Tubman and others risked their lives for freedom. The byway is part of the Great Chesapeake Bay Loop and visits authentic Chesapeake sites. Below is a description of a byway journey beginning in Cambridge. Your journey begins inside the Cambridge-based Visitor Center at Sailwinds Park East, where staff members offer insight into the historic landmarks you encounter along the way. What lies outside, beyond the Choptank River Bridge, are museums, home sites, meeting houses and other landscapes that takes travelers back to the 1850s. 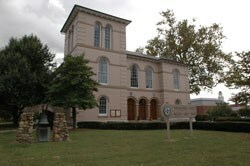 Visit the Dorchester County Courthouse, which was once the site of slave auctions and trials. 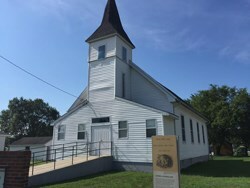 Just a short walk away is the Harriet Tubman Museum and Educational Center, dedicated to preserving Tubman’s legacy as a “conductor” on the Underground Railroad. After the museum, enjoy pleasant dining, galleries and shopping. Cambridge is also in the Heart of Chesapeake Country Heritage Area and part of the Chesapeake Bay Gateways Network, providing convenient entry points to recreational opportunities on the water. Follow the byway westward, and visit Stanley Institute, a one-room African-American school established by the newly freed black community, just after the Civil War. In Madison, Tubman learned navigation and survival skills while working beside her father, Ben Ross. Drive over Joseph Stewart's Canal, hand-dug by enslaved people and used to transport timber. Next, stop and spend several hours discovering Tubman’s life and legacy at the Harriet Tubman Underground Railroad Visitor Center where you will find immersive and emotive exhibits, programs and tours. Then, explore the water trails of the Blackwater National Wildlife Refuge before observing nature along Wildlife Drive. In Bucktown, there’s a village store where, as a teenager, Tubman in her first act of defiance, was nearly killed when she tried to help an enslaved man avoid capture. Meanwhile, guided historic and nature tours, as well as bike, canoe and kayak rentals, are also offered in Bucktown. Retrace Harriet Tubman's steps, visit key historic sites, and learn more about the Harriet Tubman Underground Railroad with this Map (pdf), Guide (pdf) and digital guide. Sail on a skipjack out of St. Michaels or Tilghman Island to experience the water on a historic oystering vessel and get a different vantage point on the landscapes of Douglass’ life. The Stanley Institute is an early example of an African-American school built and run independently by the local black community during the years between the Civil War and the Civil Rights Movement. It is open to visitors by appointment. The Edward Brodess Farm - a property along Greenbrier Road near Blackwater Refuge - is historically recognized as Harriet Tubman's childhood home. Around 1835, Harriet Tubman commited her first public act of defiance at Bucktown Village Store. Today the Bucktown Village Foundation operates the restored general store, also offering tours and renting bikes, canoes and kayaks nearby. Just south of Denton, Martinak State Park sits along the Choptank River. Camping, cabins, boat launches and rentals, fishing, canoeing and picnic areas are available. Known as "Joppa Wharf" by locals of the time, the Choptank River Heritage Center is a replica of the 1883 Maryland Steamboat Company’s Denton Wharf, and includes a small historical museum. Several hotels and campsites are found along this byway, with the greatest concentration in Cambridge and Denton. Both towns also provide opportunities to enjoy arts, culture, shopping and fine dining. Blackwater Refuge offers land trails, paddling trails, exceptional bird and wildlife viewing, as well as hunting, fishing and crabbing opportunities in season. Several local outfitters offer canoe, kayak or bicycle rentals. With the southern portion of your trip completed, head north to the East New Market National Historic District, stopping for antiques shopping along the way and then taking a self-guided walking tour amid fine examples of 18th-, 19th- and 20th-century architecture. Look for Faith Community United Methodist Church located near an old train station. Faith Community was built in 1880 on land deeded four decades earlier to a group of African-American trustees, including the Rev. Samuel Green, a free black farmer and Underground Railroad agent. Continue to Linchester, the home of a historic grist mill that employed both free and enslaved African Americans. A strong Quaker settlement in this area is revealed through the home of Jacob and Hannah Leverton, Quaker abolitionists, and at the site of a former Quaker meeting house at Mt. Pleasant Cemetery, likely a hiding place along the Underground Railroad. 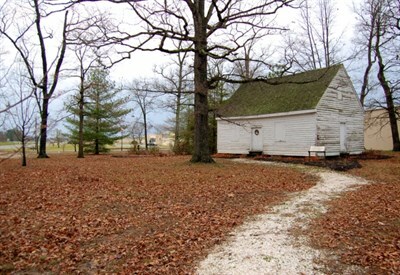 Near the town of Preston, the 1852 James Webb Cabin is the only surviving pre-Civil War log dwelling on the Eastern Shore known to be constructed by and for an African American. Built on ballast stones from ships, the cabin stands along what may have been an Underground Railroad route used by Harriet Tubman and her parents. The next stop is Denton, which holds many ties to the Underground Railroad. Courthouse Square was the site of a slave market and a jail that held Underground Railroad conductors. 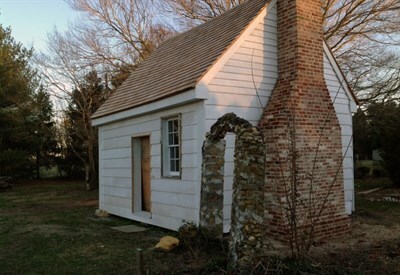 The nearby Tuckahoe Neck Meeting House was built in 1803 and featured prominent Quaker women speakers who knew Tubman. 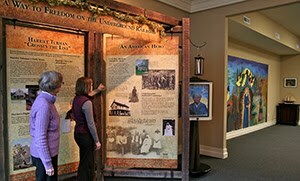 The Museum of Rural Life includes exhibits about the Underground Railroad and local African Americans. From here, continue north through the historic towns of Greensboro and Goldsboro before reaching the Mason and Dixon line along the Delaware border, or take the side track to Wye Mills from Denton. If you choose to take the side track, head west on MD 404 at Denton to learn about Frederick Douglass, the famous 19th-century orator and statesman who began his autobiography, “I was born in Tuckahoe, near Hillsborough, and about 12 miles from Easton.” See where Douglass began his journey through St. Michaels, Annapolis, Baltimore, and other points along the Chesapeake Bay, to finally escape his enslavement to become an abolitionist leader. On March 11, 2017, the Harriet Tubman Underground Railroad Visitor Center opened to the public to immerse visitors in Tubman’s world through informative, evocative and emotive exhibits. Kate Clifford Larson, author of Bound for the Promised Land: Harriet Tubman: Portrait of an American Hero, points out myths and facts about Harriet Tubman’s life. The audio guide brings to life stories of slavery and escape, cruelty and compassion. Soundtracks include dramatizations and commentary by experts, historians, and local community members. Explore the rich history and contributions of Maryland’s African Americans on this road trip from the Smithsonian National Museum of African-American History and Culture in Washington D.C. through Maryland's Eastern Shore. From Linchester, a quick detour takes you to Poplar Neck, a mid-19th-century farmstead where Tubman’s father was employed and worked undercover as an Underground Railroad agent. Visit a small waterfront park in the town of Choptank for a sweeping view of the Choptank River before proceeding to Preston. The Choptank River Lighthouse at Long Wharf Park, Cambridge, is a replica of a historic six-sided screwpile lighthouse that guided mariners along the Choptank River for generations. It houses a small museum. Harriet Tubman died on March 10, 1913, at the New York rest home that she founded to assist indigent and aged African Americans. A celebrated suffragist in later years, Tubman was believed to be 91 years old at the time of her death. Though women were not allowed to join the Army, Tubman served as a spy and a scout during the Civil War.